Stepwise variable selection procedures are computationally inexpensive methods for constructing useful regression models for a single dependent variable. At each step a variable is entered into or deleted from the current model, based on the criterion of minimizing the error sum of squares (SSE). When there is more than one dependent variable, the situation is more complex. In this article we propose variable selection criteria for multivariate regression which generalize the univariate SSE criterion. Specifically, we suggest minimizing some function of the estimated error covariance matrix: the trace, the determinant, or the largest eigenvalue. The computations associated with these criteria may be burdensome. 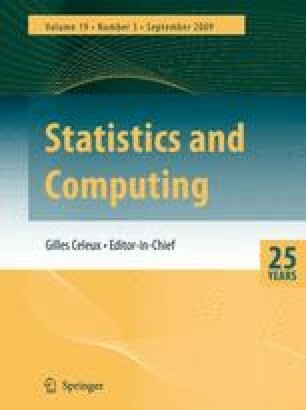 We develop a computational framework based on the use of the SWEEP operator which greatly reduces these calculations for stepwise variable selection in multivariate regression.